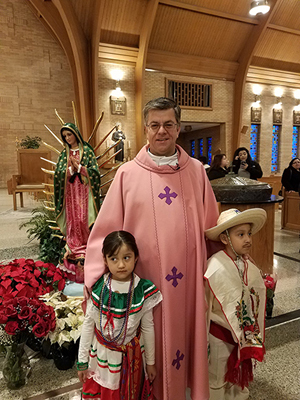 Father Mike Houston, C.Ss.R., during a celebration of the feast of Our Lady of Guadalupe at St. Gerard’s in Lima, Ohio. Hispanic ministry at St. Gerard’s in Lima, Ohio, has been growing at a slow and steady pace. For the past three years we’ve had a weekly Sunday liturgy in Spanish. Both Father Mike Sergi and I currently celebrate Mass in Spanish with the help of the officially retired but still active Deacon Elias Peña. Regular Sunday attendance at the Spanish Mass varies from 30 to 60 people. A major contributor to the effort has been Angelica Pierre, whose deep faith and dedication serve as a great example for the Hispanic community. The Misa de sanaciòn (healing Mass) we’ve been celebrating has become quite popular, with Hispanics coming from as far away as Columbus, Ohio, and Fort Wayne, Indiana. Recently after such a Mass in Toledo, I was approached about the idea of celebrating Misas de sanaciòn in other parishes throughout the Diocese of Toledo as well as the possibility of celebrating them in the migrant camps. A notable feature during the celebration of the Eucharist is the Spanish choir, which has grown in size and talent over the past few years and has become a source of pride for St. Gerard’s. Ways have been sought to make Hispanics feel welcome in and integrated into the parish, including opportunities to celebrate Hispanic culture. For example, the Spanish choir and a local troupe of Guadalupano dancers greatly enhanced the recent parish celebration of the feast of Our Mother of Perpetual Help. And during the annual parish festival, the Mexican food stand provided some tasty treats for the community. Immigration issues are on the minds of many Hispanics these days. 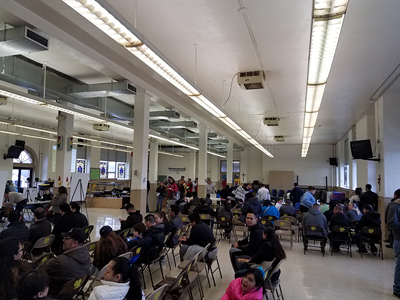 A recent visit of the Mexican Consulate to St. Gerard’s provided assistance and was enthusiastically received by area residents. Nearly 500 people attended the event, which highlighted the surprisingly large number of Latinos who live in the Lima vicinity. By contrast, it is interesting to note that the official number of Hispanics living in Lima is only 3 percent of the local population. Nearly 500 people turned out when the parish hosted a visit from the Mexican Consulate. We’ve recently become involved in migrant ministry. Currently there are only three priests (including me) available to serve the ministerial needs of migrants who work in the northwestern region of Ohio during the summer. There are roughly 20 migrant camps in northwestern Ohio and northeastern Indiana. The great emphasis on immigration reform by the current administration has begun to affect local economies in different areas of northwestern Ohio. The number of work visas being granted to migrant workers is declining, and the fear of deportation has also affected the number of available migrants for the region.